1. A pot with a heavy bottom and a tempered glass lid is ideal for this preparation. 3. 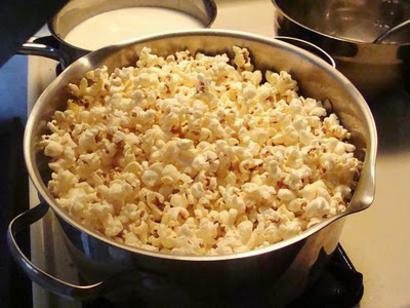 Then cover the pot and leave it on high heat a few minutes until you can see and hear the popcorn begin popping. 4. While popping, push and pull the pot in a back and forth motion over the flame. This keeps the kernels moving a bit initially, and the flame from being concentrated in one area only. 5. When the popping sound lightens up, turn off the heat and carefully lift the lid to release the steam. 6. You can pour the finished popcorn, while still hot, into a large paper grocery bag. That makes it much easier to add salt. Add salt as desired and shake the sealed bag well.